Childish Gambino's "This Is America" and The Carters' "APES***" were the most talked-about videos of the last year, at least if the metric you use involves thinkpieces and social-media chatter. 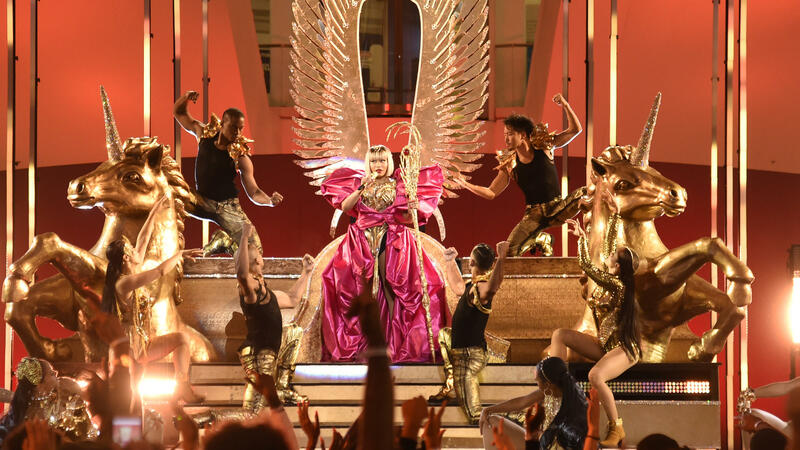 But by the time Madonna announced the video of the year winner on Monday night's MTV Video Music Awards, the two had been largely relegated to afterthoughts. Instead, the two biggest prizes of the evening — artist and video of the year — went to Camila Cabello and her frothily charming smash "Havana (feat. Young Thug)." Sure, "This Is America" won for best choreography, best direction and best video with a message, while "APES***" took home prizes for cinematography and art direction. But throughout the telecast, the biggest awards went to less elaborately staged, more commercial fare like Post Malone's "rockstar (feat. 21 Savage)" for song of the year, Jennifer Lopez's "Dinero (feat. DJ Khaled and Cardi B)" for best collaboration, Ariana Grande's "No Tears Left to Cry" for best pop and Nicki Minaj's "Chun-Li" for best hip-hop. Cardi B, who opened the night by introducing a Shawn Mendes performance, was another big winner, taking home trophies for the Lopez collaboration, best new artist and song of the summer for "I Like It," which she'd recorded alongside Bad Bunny and J Balvin. On a night that showcased several high-profile performances by Latin artists — including a grabby spot by Colombian superstar Maluma — Balvin and Willy William also won in the category of best Latin for "Mi Gente," which has been streamed nearly 2 billion times on YouTube. This year's VMAs telecast was notable for its high-profile no-shows, including The Carters (that'd be Beyoncé and Jay-Z), Drake, Childish Gambino, Bruno Mars and Ed Sheeran — all of whom were shut out of the night's biggest prizes. (Of the awards given out on air, only J Balvin and Gambino weren't there to claim their trophies.) Hayley Kiyoko took a well-deserved prize for the cryptically named Push artist of the year, and got to perform "Curious" briefly, but the night's remaining winners — Imagine Dragons for Best Rock, the late Avicii (feat. Rita Ora) for best dance, N.E.R.D. & Rihanna for best editing, Kendrick Lamar & SZA for best visual effects — went mostly unmentioned. Of course, the VMAs have always been about "moments" as much as awards themselves, and, as was the case last year, these didn't offer a flashpoint like Miley Cyrus twerking or Kanye West barging into a Taylor Swift speech with the immortal words, "I'ma let you finish." 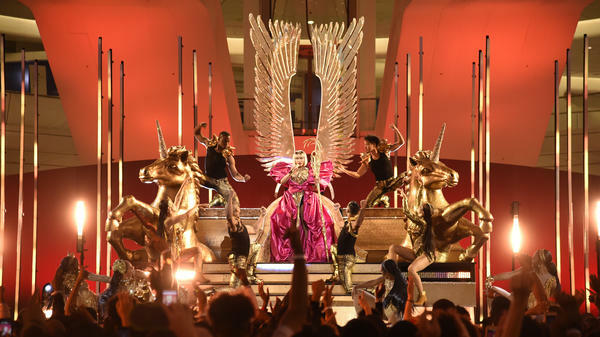 The closest thing we got was a makeshift tribute to Aretha Franklin — who died Thursday, just four days before the VMAs — by Madonna, who stood before a giant photo of the late icon and... told a lengthy story about herself. She talked about an audition, very early in her career, in which she sang "(You Make Me Feel Like) A Natural Woman" — a song Franklin popularized but didn't write — and, was pleased to report, did very well for herself. It was, in a word, baffling: An Aretha Franklin tribute in which the big takeaway was that Madonna once sang the same song she did... well, let's just say the optics weren't great. But then again, that's kind of the VMAs in a nutshell, right? No matter how long or indulgent or inscrutably intentioned they are, what matters most — to organizers, anyway — is that we're still talking about them in the morning.